Attributes of Asmaye- Husnaa is out today's topic. The person who read asmaye husnaa gets lots of benefits , Every single Name of Allah has different benefit just read in a right way and achieve the result . 1- Ya-Wadoodoo, Is powerful for creating love between husband / wife, Siblings, Child and parents etc. 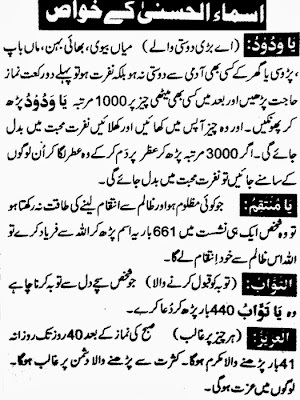 If you think two people hate each other and due to aversion they wil be in trouble, so recite this wazifa. Read 1000 times and do Dam on sweet dish and give to both person to eat. read 3000 times and blow / Dam on perfume / Itar and go in front of your enemy, due to blessings of this ayat your enemy even love you. Invocation / complain to Allah to get his revenge. 3- At-Taw-Wa-Boo, Meaning ( accepts repentance), who wants repentance from Allah then readthis ism 440 times and pray to get repentance of your all sins. 4- Al-Azeezoo, ( Prevail over everything ), After namaz-e-Fajar the person who read this ism 40 times daily will get graceful personality, and people respect him. 1- Ya Aleemoo, ( one who know the outward and inward ), Read 21 times a day and blow / Dam on water and drink water to get sharp mind, faster memory. 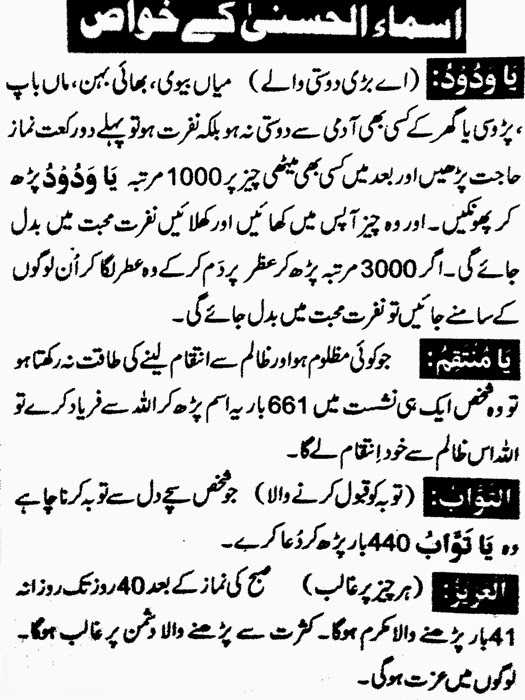 2- Ya Qud-doo-soo, / Ya Bir-roo (defect-free), If any one has bad habits like drinking, smoking, anger, Stubbornness etc, then read Ya Qud-doo-soo101 times / Ya Bir-roo 1111 times daily and blow upon water and give the water the person who have bad habit to dink. 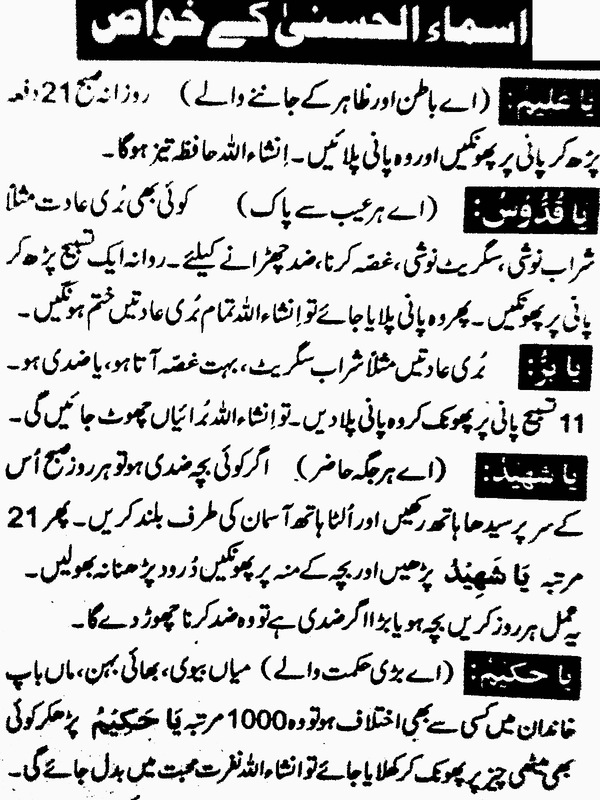 By the blessings of ayat all bad habits Shall be exemption. 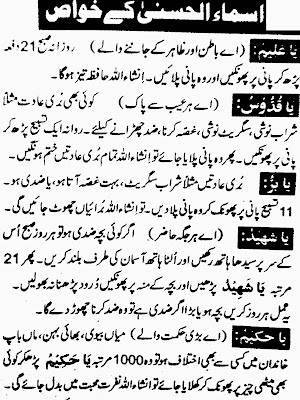 3- Ya Shaheedoo, if a kid / child Stubborn then put right hand on forehead of the kid, and Raise towards the sky then read 11 times durud sharif 21 times ya Shaheedo and 11 times durud sharif and blow upon the face of kid. 4- Ya Hakeemoo, If a family has disputes in relations then this ism will creates love between them.read Ya Hakeemoo 1000 times blow upon sweet dish and give the family to eat to create love and unity.